I recently picked up a complete set of AE92 Corolla GTS factory alloy wheels from the wrecking yard (and two of the tires were even in great shape). 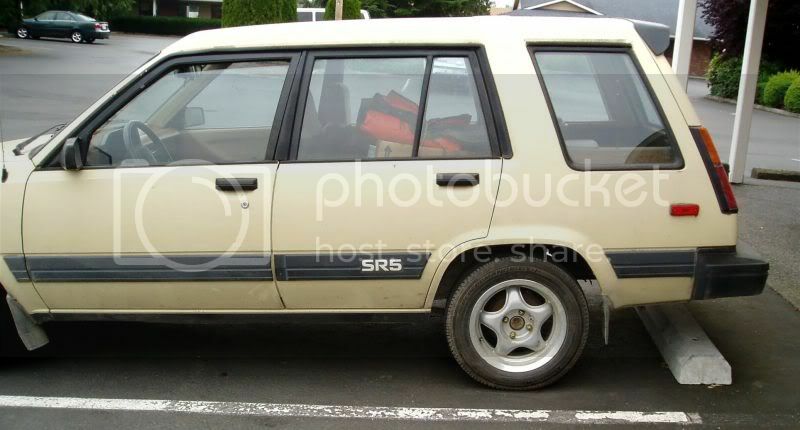 They are 5.5x14, and kind of rare, I feel luck to get the whole set (the car in fact was in great shape, the owner had thrown a rod on the engine, not a reason to junk a GTS). 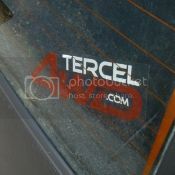 Let me know what you think, I am not sure how much I like them on the Tercel. 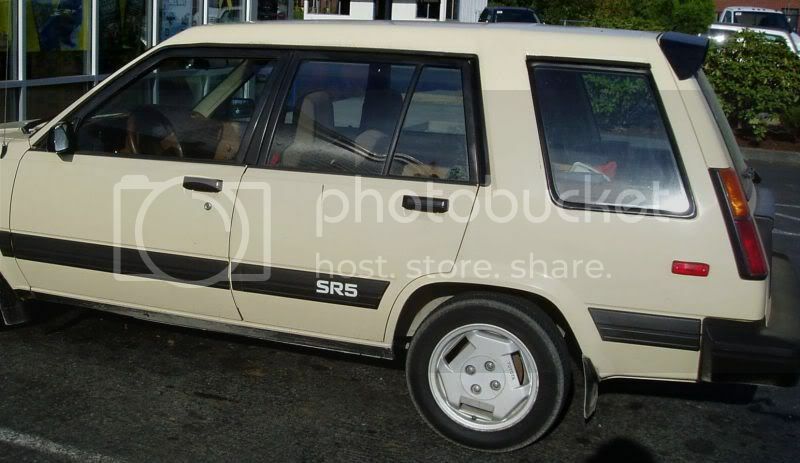 My tercel:: Sold my 1987 Tercel Dlx 4x4 Wagon but miss driving it everyday. I don't miss working on it, though. I think those wheels look pretty great! Very spiffy. Makes the wagon look like it goes FAST. "I'm high on the real thing: Powerful gasoline, a clean windshield, and a shoeshine." MUCH better than the MR2 wheels - or the OE T4WD wheels, for that matter. I did not pop for them back in '82 - didn't like 'em back in the day and their looks did not grow on me over the years. These new wheels just look more "tech." And - WOW! on their shininess! How much did they run you? I would imagine that, if you decide not to keep them, you would not lose a penny on their sale. hberdan wrote: Makes the wagon look like it goes FAST. Hah! fooled you! Actually it has much better performance tires on it than I have on my MR2 wheels, it handles better. I think total cost was about $68, including the lug nuts and the tires (at Pull-A-Part), complete sets are hard to find-they go quick. I saw them in the processing yard the week before, and dropped in every morning until they it came out (and talked friendly with the yard guy, who actually removed them for me when he still had it on the fork lift). A great deal for the tires alone. I was looking for something more open so I can paint my calipers red and show off my vented disks. Though these say "Toyota" on them, and would be consistent with turning my car into a "Tercel4wd GTS Twin-cam". I have to be honest - I think the MR2 wheels fit the looks of the T4wd better. 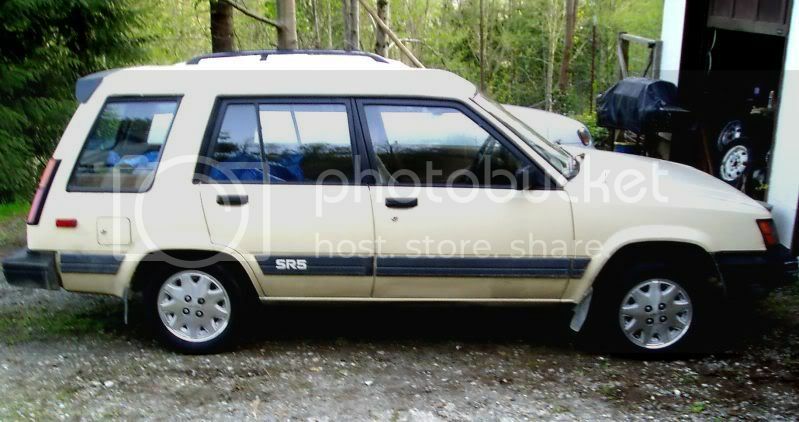 They are more raw-looking and 'angular', and seem to jive better with the sharp lines of the Tercel. The GTS wheels are shinier, but they remind me of wheels from an early '90's Camry. I thought they looked too generic when the GTS came out. But of course it's your car and your call. You did get a really good deal. 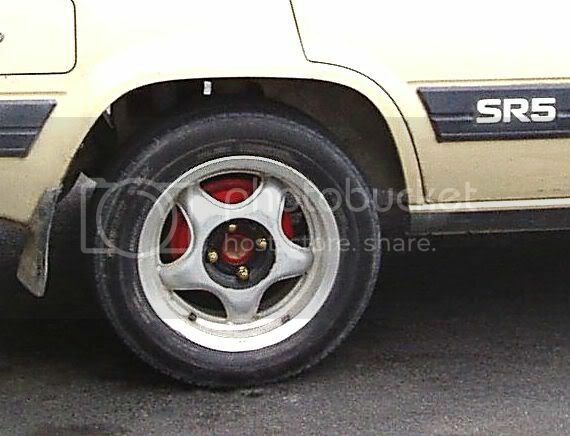 danzo wrote: I have to be honest - I think the MR2 wheels fit the looks of the T4wd better. 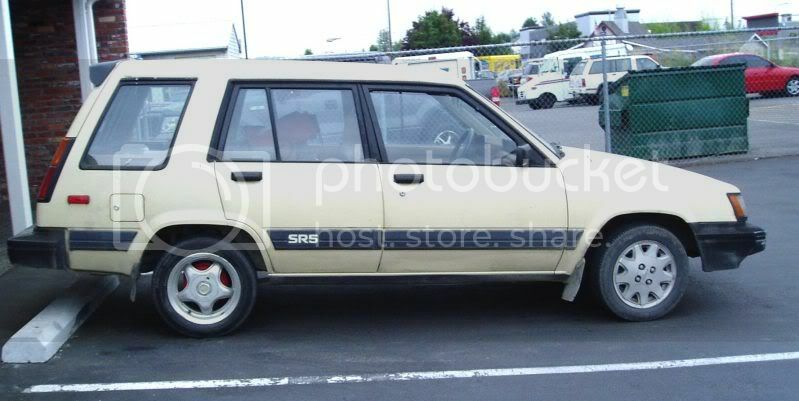 They are more raw-looking and 'angular', and seem to jive better with the sharp lines of the Tercel. I agree Danzo, in fact I think the MR2 wheels look better on the T4wd than on the MR2 (I have never liked them on the MR2 in fact). but on the boxy little T4wd, they look heavy and robust for off road use. The MR2 should have light looking thin spoke wheels. 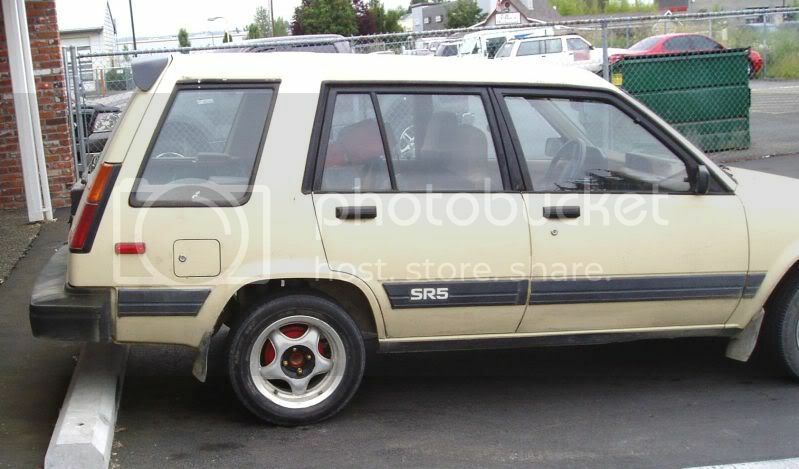 I owned an AE92 for a short time with those wheels, and they kind of grew on me, but I never did have a chance to try them on the Tercel. When they showed up in the Pull-A-Part I snatched them and thought I would decide later. they do look kind of shinny and modern and luxury car look rather than sporty. I figured I could sell them on 4age list after I have worn out the tires if I did not want to keep them. Now I have several other wheels to choose from and I would like see what you guys think. 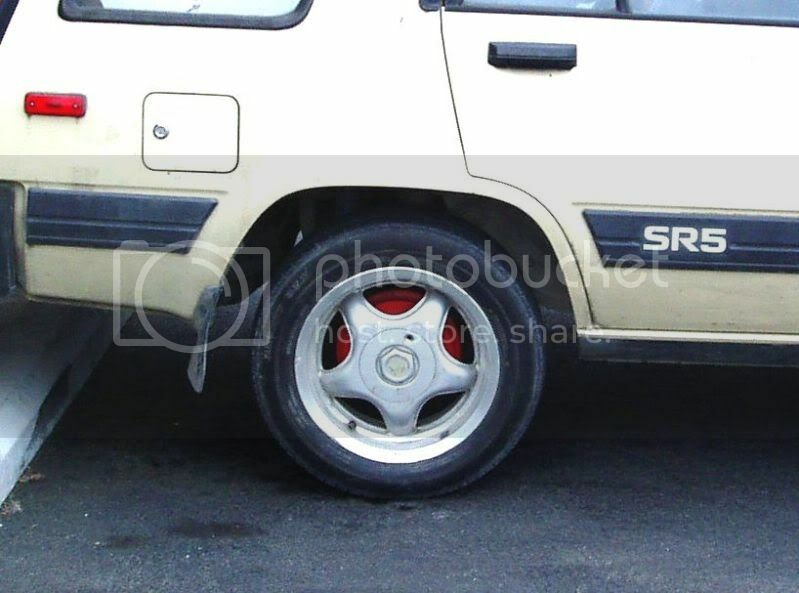 I got these 6"x14" german made wheels off of a CRX parts car, and I think they might look cool on my Tercel. here is how it looks without the hub cap (ignor my very dirty car, just look at the wheels please). Here is a detail, I painted the center black, and added some gold lug nuts I found in a closeout bin. I also painted my drum red since I am planning on doing that to my brakes front and back. This is how it looks with the hub cover, I only have two (the other two are damaged, but I could make some flat ones). this is with the Corolla GTS wheels on the front. These are actually the same size wheels and tires, odd it looks different. Which set up to you all like? 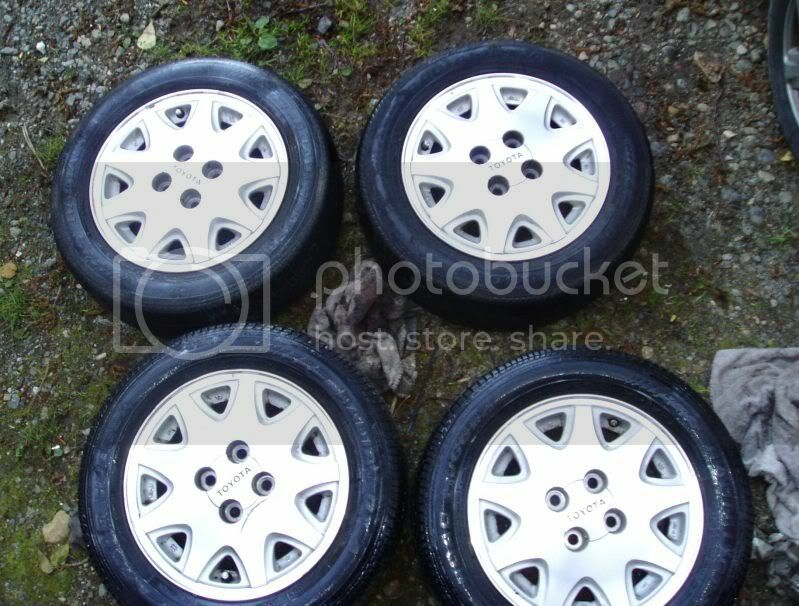 Do any of these look good, or are the MR2 wheels still the top choice for appearance for the Tercel4wd? I might go one size larger on the tires when I actually buy a matching set of tires new. These are 185/60x14, I was thinking of going to 195/60x14. 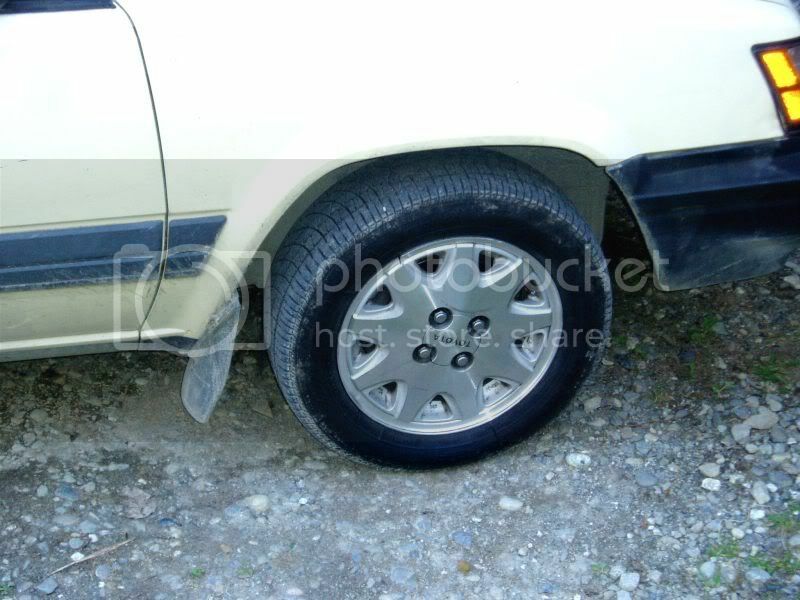 + + + on the Corolla wheels - they look in wunnerful condition! I was looking for a more open wheel to show the brakes, and make the car look lighter. I just happen to have these 5 spoke wheels. I could keep checking CL and the wrecking yard until I find something lighter looking. But these German made 5 spoke wheels appear well made and very lightweight (likely were very expensive when new), so I thought I would invest in some new tires for them. This light of a car means I will have them for a long time however, so I want to make sure I like the look. So far I like the black center w/gold lug nuts showing the red brakes. The Corolla GTS wheels are nice looking, but they have a "factory" look, and are not particularly light (very strong however). And they, and the MR2 wheels, do not show off the brakes. i say stick with the MR2's. i like the CRX wheels with the blacked-out center more than the corolla wheels but MR2's still top them both.